One day, the big tree in the middle of your backyard looks perfectly healthy with all of its strong limbs covered in lush foliage. But the next, one of those limbs has suddenly broken off the tree and fallen onto your lawn. The weather has been mild and there aren’t any obvious signs of damage—so what in the world happened?! Your tree may have been the victim of what is commonly known as sudden branch drop syndrome. This curious condition tends to affect trees when it’s especially hot outside. Seemingly out of nowhere, you’ll hear a loud crack as an apparently healthy branch breaks free from the tree and falls to the ground. It’s a strange phenomenon that has perplexed arborists for decades. There’s no definitive consensus as to the cause of sudden branch drop syndrome, but there are a few plausible theories. Many arborists think the condition happens when humidity gets trapped in trees on hot days. This humidity typically escapes trees through their leaves, but when it’s really hot out, that humidity can get trapped in a tree and compromise the strength of its branches. Other arborists have suggested that sudden branch drops may be caused by internal cracks in a tree, tissue shrinkage caused by heat, deterioration in trees at the cellular level and more. 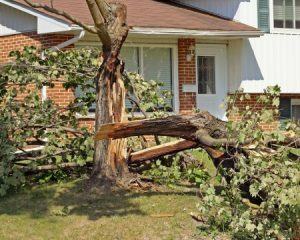 Whatever the cause may be, a sudden branch drop is typically a very unwelcome event for homeowners. Need a hand clearing fallen limbs off of your property? The team at Brother Tree & Lawn Service would be happy to help. Give us a call or contact us online to schedule your appointment today!